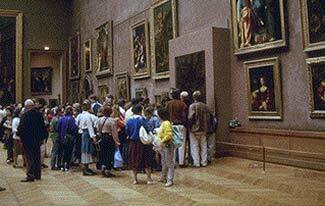 ABOVE: Is it worth standing in line to see the Mona Lisa through bulletproof glass for 15 seconds? Most people who come to Paris want to go up the Eiffel Tower, visit Notre Dame Cathedral, walk or take a sightseeing-boat cruise along the Seine, and--if they're a little more ambitious--head for Montmartre to visit Sacré-Coeur. Not that there's anything wrong with that, to borrow a phrase from Seinfeld--but don't let anyone tell you that you're required to obey the crowd or a canned itinerary. Take the Louvre: Many tourists stand in line for tickets, gawk at a few brand-name artworks like the Mona Lisa and the Venus de Milo, and head for the exit doors in less than an hour. If you're an art aficionado, then the Louvre is definitely worth your time and money--but if you never visit art museums back home in Buffalo or Bristol, why feign an interest in paintings and sculpture just because you're in Paris? You might be happier exploring the Paris Sewers Museum, getting an aerial view of Paris from a tethered balloon, visiting celebrity graves in Père Lachaise Cemetery, or taking a cruise on the St-Martin Canal. As for Sacré-Coeur, it's impressive in a grandiose 19th Century sort of way, but it's no rival for Notre Dame Cathedral, and the Métro ride may not be worth your time unless you plan to spend the day (or at least a few hours) enjoying the village atmosphere on the southern slopes of Montmartre. Our advice: In the immortal words of The Mamas & the Papas, "You gotta go where you wanna go, do what you wanna, wanna do." When sightseeing, follow your own desires and common sense. 3rd inset photo copyright © Didier Faucher.